"A lot of people are happy with GDP numbers" but "in the past century the vast majority of all recessions have begun in a quarter that showed positive GDP growth." Oct 28, 2011: Steve P: Kirk, just want to say you had a great batch of sell actions last week. Many of the financial threads I follow were saying a buy is in in their weekend notes. Yet you were selling. Good job. 9/26/11: Barbara H: Yes, another year of your insightful newsletter. Check is in the mail. Subscribe NOW and get the November 2011 Issue for FREE! ! The table here shows the Maximum capital gains tax rate history plus top federal income tax rates since 1916. In 1916 the Capital Gains Tax Rate was 15%. Between 1987 and 1996, Capital Gains Tax Rate was between 28% and 29.2%. In 1997, under president Bill Clinton, they cut rates to 21.2% and the stock market took off. 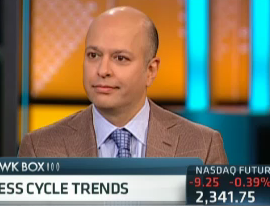 In 2003, rates were cut again and the market had another big rally, more than doubling before the financial meltdown. Today the market seems stuck in a quagmire... could it be because capital gains tax rates return to 25% (21.2% plus 3.8% for Medicare under the Obama-care plan) in 2013? Below is a list of my current articles on Seeking Alpha. 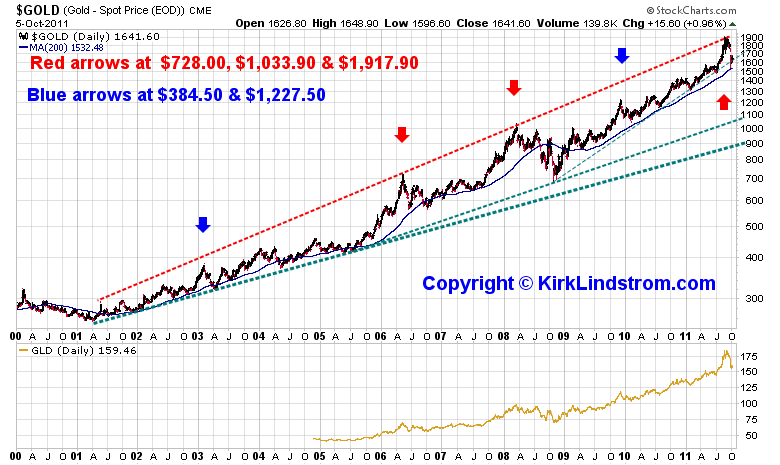 "The price of gold made an all-time high Monday, July 18, 2011, at $1,602.40. 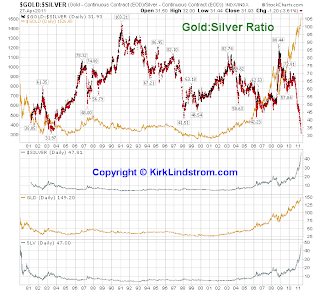 Silver closed Monday at $40.34, up more than double from a year ago, but it remains well off its recent high of $49.82.....This means an ounce of gold is now less than 40 times more expensive than an ounce of silver." 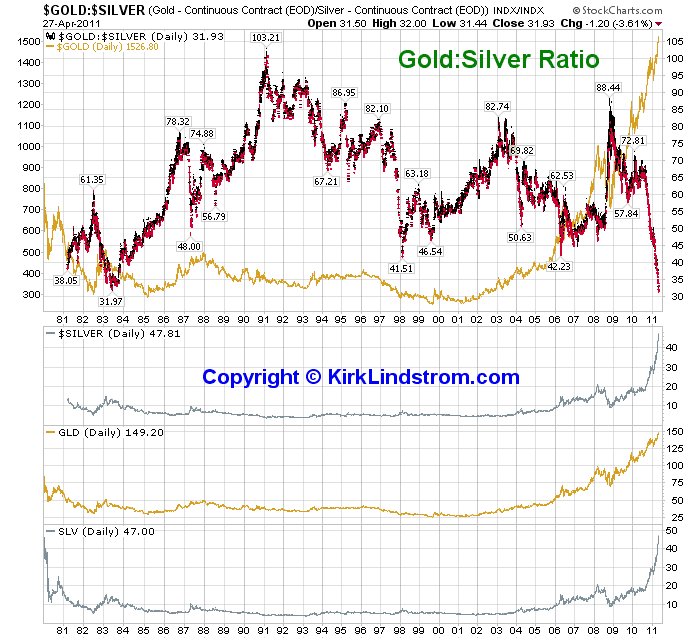 July 13 Dow to Gold Ratio Still Following Strong Resistance Line Lower "At 7.96, the Dow Jones Industrial Average measured in how many ounces of gold it takes to buy the 30 stock Dow is only 13.2% from its 17-year March 6, 2009 low of 7.03. But, as the chart below shows, the ratio has been in a fairly flat, two-year trading range as it moved from long-term support to resistance." July 10 Global Inflation Pressure Falling: Use TIPS to Profit "Five of the seven regions covered show decreasing inflationary pressure with Australia ticking up but still in a decline overall while Japan was flat." Too bad this is too close to the truth! Did Raising Minimum Wages Kill Job Creation? How much did raising the minimum wage 41% between 1997 and 2009 contribute the inability of the country to create jobs after the past two recessions? Could the prosperity of the 1990s be due to everyone being able to get a low paying job which gave them a small reward for reliably showing up to work but MORE IMPORTANTLY gave them incentive to improve themselves and move up to a higher paying job? 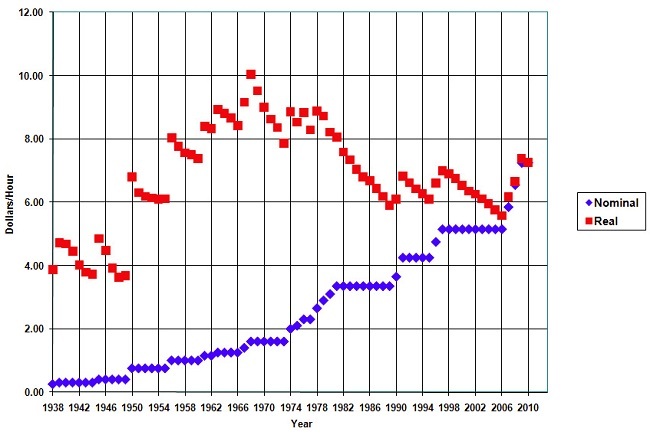 Chart of United States Minimum Wage History from 1938 through today. My FIRST job at age 16 was busing tables at $1.35 an hour back when the minimum wage was $1.60. They were able to pay me below minimum wage because I got a $2 food allowance that bought a hamburger and a shake. Since I did a good job, the cooks rewarded me by upgrading me from a regular burger to a bacon cheese burger with fries. I learned it was a big deal to do a good job to make my co-workers jobs easier AND get a bigger share of the tips. I quit after six months when soccer season started so I could play on my school team again. My second job was washing cars for minimum wage of $2.10. They were upset I quit after only a month or two but I told them I'd love to stay at the outside job IF they could give me the $3/hr salary. The car wash boss wished me luck in my new job as a salesman inside a national department store. The International Money Fund, IMF, expects slow but steady economic recovery for the United States two years after the worst of the financial crisis. The recovery has proceeded at a relatively slow pace, as in the aftermath of other severe financial crises, and has recently weakened. Monetary and fiscal policies have continued to support demand in the last two years, but the ongoing repair of household balance sheets amidst declining house prices and high unemployment have weighed on private consumption, while construction activity has remained depressed. On the positive side, exports have recovered markedly and financial conditions have improved, bolstered by unprecedented liquidity support. Core inflation has started to firm from historic lows. 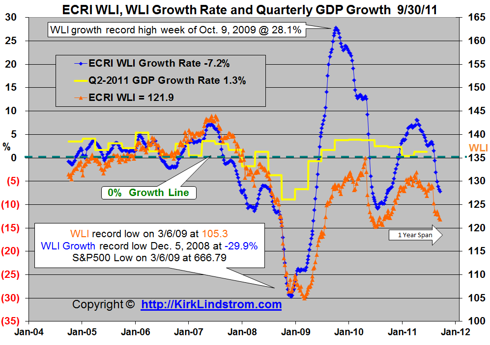 Recent indicators point to a growth slowdown in the first half of 2011, which appears related to increases in world oil prices, as well as to transient factors such as the disruptions to global supply chains from the Japanese earthquake. Continued housing market weakness, with the possibility of further house price declines reducing household wealth and, thus, weighing on private consumption. Unfavorable fiscal outcomes. These could take the form of a sudden increase in interest rates and/or a sovereign downgrade if an agreement on consolidation does not materialize or the debt ceiling is not raised soon enough. These risks would also have significant global repercussions, given the central role of U.S. Treasury bonds in world financial markets. At the opposite extreme, an excessively large upfront fiscal adjustment could also significantly weaken domestic demand. Further commodity price shocks, which could impact both growth and inflation. Tight credit supply conditions—with weak securitization markets and tight loan standards for most sectors—which may become more binding as credit demand recovers. Challenging conditions for some European sovereigns that might trigger new global financial shocks. This video stands on its own. Make sure you watch the bit near the end (starting at 8:10) where former president Bill Clinton gives his opinion. In May, the USFIG fell to 101.0, down from a revised 102.9 in April. 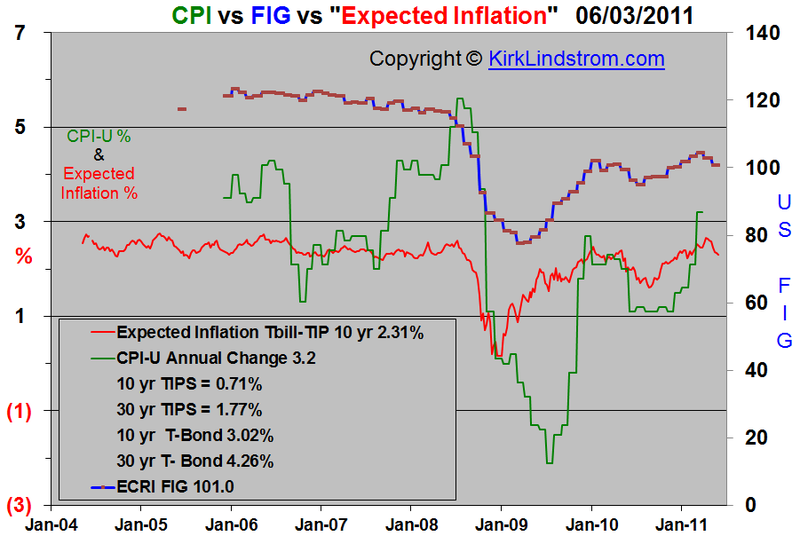 My chart below of CPI vs USFIG vs "expected inflation" for the next decade shows USFIG was down for the second straight month. Commenting on today's release, ECRI's Co-Founder, Chief Operations Officer and author of "Beating the Business Cycle", Lakshman Achuthan said: "With the USFIG hitting a seven-month low, underlying inflation pressures have clearly begun to recede."